I was born in Brooklyn, New York, in 1946. 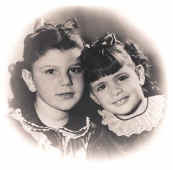 I lived in a four family apartment house with my parents, my older sister Ronnie (she's the one on the left in the picture) and Grandma Rose. My aunt and uncle and cousins lived in the same apartment house and my best friend lived next door in a house just like mine. I thought I would live there forever and that was fine with me. But then we moved to a two family house in another part of Brooklyn. My aunt’s family moved with us but I was leaving my friend. It seemed like the end of my world. I just knew I would never have another friend. Before long, though, I got used to my new neighborhood and made new friends. There was so much to do where I lived. I particularly remember the summers. I was out all day playing ball against the side of my house or running in the middle of the street in a hot game of tag. Sometimes our games were interrupted when someone yelled CAR! and we all would scatter to the sidewalk until the danger passed. Then we would pick up where we had been as if we had never stopped. Often the parked cars became bases for our punchball games. At night, all the children on the block and their parents would sit out on the stoops eating ice cream. I moved to Queens when I was ten years old. It felt like a different world. It was so quiet! There were no trolley cars clanging. No kids shouting across the street to ask if you wanted to play. The city seemed far away. The good thing was that there were several libraries near my house. We did not have many books in our house and I loved to read. Now I was able to get books any time I wanted so I was reading more and writing a lot. I always liked to write. And I wrote about everything. I wrote about my mother and her plants, about my neighbor next door, about Myrtle, our turtle, about learning to ride a bike. I wrote stories that made people laugh and long letters to my uncle who lived near Chicago. I wrote notes and diaries and letters to myself. It didn’t seem unusual to be writing all the time. I thought everyone did. Although I loved reading books, I never imagined that I could write one. Then in sixth grade, my teacher gave us an assignment to write the first chapter of a book. I had no idea if I could do it but it was homework so I sat down and started writing. I wrote the first chapter of a mystery book because I liked reading mysteries and something strange happened. I didn’t want to stop! So I wrote the second chapter and realized that I could write the third and the fourth and as many chapters as I wanted. I knew then that some day I could, and would, write books. I would be an author. I did many things along the way to being an author. I taught in schools. I wrote for newspapers and magazines. I got married and raised a family of my own. Yet, all the while, I worked on stories that one day, I hoped, would be published as books. I was still writing about everything. A day spent picking blueberries turned into an article for a newspaper. A poem about a cherry tree in our front yard was published in a poetry journal. My daughter's experiences as a dancer became the basis for a young adult novel – my first published book! It was published in 1989 and is still in print. Since then, I have written many different kinds of books, both fiction and non-fiction, for children -- picture books and joke books, activity books and easy chapter books. I write from what I see and hear and experience. When I travel to other places, I bring the feeling of those places into my books as I did in The Emperor's Garden after a trip to China. Someone once said that there is nothing new to write about in the world. I think that everything is new to all of us all the time because we see things in different ways. I like to share how I see things. And because each day is unique, special in its own way, there is always much to write about. It is a privilege and a joy for me to be able to write about everything and to call myself Author.